During the Carboniferous and Permian periods, prehistoric amphibians evolved along a number of parallel lines towards a reptilian condition. Some of these amphibians (e.g. Archeria, Eogyrinus) were elongate, eel-like aquatic forms with diminutive limbs, while others (e.g. Seymouria, Solenodonsaurus, Diadectes, Limnosceles) were so reptile-like that until quite recently they actually have been considered reptiles, that some of them they may still turn out to be reptiles, and it is likely that to an observer they would have appeared indistinguishable from small or large reptiles. Although the first amniote reptile probably appeared in the late or even middle Mississippian period (Middle Carboniferous), as forms like Casineria would seem to indicate, a number of lines of reptiliomorph amphibians and proto-amniotes continued to flourish alongside their fully reptilian (crown amniote, to use the cladistic term) descendents and relatives for many millions of years. In 1956 Friedrich von Huene included both amphibians and anapsid reptiles in the Reptiliomorpha. This included the following orders: 1. Anthracosauria, 2. Seymouriamorpha, 3. Microsauria, 4. Diadectomorpha, 5. Procolophonia, 6. Pareiasauria, 7. Captorhinidia, 8. Testudinata. (Von Huene 1956) Now we know that these groups belong to very different lineages, and similarities are the result of convergences or shared primitive features. Range: from the Early Carboniferous. Domed skull, retaining kinesis (skull roof loosely attached to cheek); skull usually with fine radiating grooves; tabular large & attached to parietal; deep otic notch in quadrate; some with slight, impedance-matching stapes; pleurocentrum dominant element of vertebrae; well-developed limbs; 5 digits; usually terrestrial. Note: A reminder that we are referring to the crown group Tetrapoda*, i.e. frogs + dogs. Reptiliomorpha is one stem from the tetrapod node by definition. The other stem really ought to be called something other than Lepospondyli, since we really don't know if the traditional lepospondyls included the ancestor of modern amphibians. ATW021214. Reptiliomorpha : (Gephyrostegidae + Batrachosauria) + * : Eoherpeton + (Chroniosuchia + Embolomeri). Characters: "Kinetic line," i.e. abrupt angle between skull table and cheek without interdigitating suture & possibly mobile (primitive) [C02]; tabular contacts parietal [C02]; tabular horn or process common [C02]; intertemporal present (primitive) [C02]; "otic notch" present; posttemporal fossae absent; stapes massive [C02]; still has sarcopterygian skull hinge; moveable joint at basicranial articulation primitive) [C02]; closed palate without vacuities (primitive) [C02]; vertebrae gastrocentrous, with pleurocentrum dominant element [C02]; lozenge-shaped interclavicle; 5-toed hand [C02]; ilium with 2 dorsal blades [C02]; amphibian ankle; 2-3-4-5-3 almost reptilian) phalangeal count. Note: In the figure, the intercentrum is shaded. The rachitomous type is dominated by the intercentrum, and the pleurocentra appear as paired, dorsolateral elements cushioning the notochord.. It is highly flexible and permits simultaneous twisting and bending -- appropriate for aquatic mobility, but likely to collapse on land. In the gastrocentrous vertebra, the emphasis is on supporting the arch. The neural arch sits firmly on the intercentrum and the pleurocentrum is reduced to a small, spacer element. This configuration allows less mobility, but assists the spine to bear the weight of the body on land. The embolomerous vertebra is characteristic of the secondarily aquatic embolomeres. The intercentrum reappears as a major structural unit, and both centra form complete disks. This conformation with successive small disks, recovers some of the flexibility of the rachitomous vertebra, while maintaining considerable strength and stability. References: Clack (2002) [C02]. ATW020620. Eoherpeton: E. watsoni Panchen 19?? Range: Early Carboniferous (Namurian) of Europe (Scotland). Phylogeny: Anthracosauroidea : Chroniosuchia + Embolomeri + *. 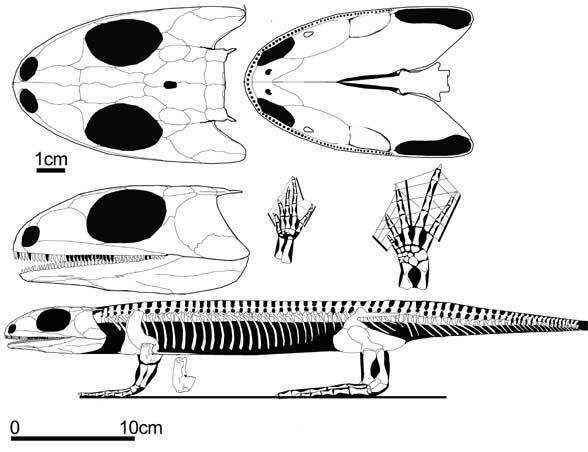 Note: Eoherpeton has been variously classified as a gephyrostegid, an embolomere, and an anthracosaur i.s. It may also be none of the above. By way of explanation, this is one of these awkward areas in which we must recall our principles, even if we don't stand by on them. If Reptiliomorpha is defined as a stem group (dogs > frogs), then Anthracosauroidea must logically be a crown group (Gephyrostegus + Pholiderpeton). There is no guarantee that Eoherpeton falls in this group, particularly since the gephyrostegids are not very well known. It is included here among the anthracosauroids only by convention. ATW020621, MAK981010.